The Beard Team USA Blog: Burke wins it! Burke Kenny, the pride of Olympia, Washington and all of 22 years old, was crowned world champion in the full beard styled moustache division at the world beard and moustache championships in Brighton, England on September 1, 2007.
a great beard! and the pipe was the perfect touch! Great Job Burke! I am glad you won man. You have an amazing Beard and Moustache, and defiantly know how to style it. Congrats BTUSA, wish I could have made it to cheer you all on. Great job Burke! We met you at the Lake Tahoe event last year - the couple from Connecticut. Happy to see lots of USA winners in Brighton. That is the coolest beard I've ever seen! Way to go! I knew you would capture the crown. Congratulations! You're the best! Wow! I can't even imagine what his beard from below looks like!!! 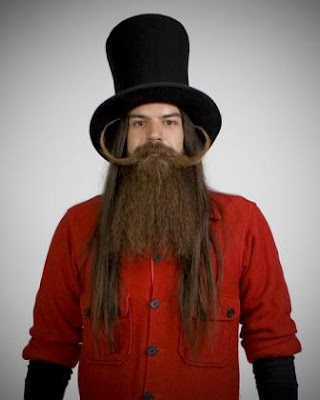 Hope to see Burke at the world beard championships this year! men is that a beard? for a moment I thought in a costume, but no is a total, natural, hairy and dirty beard, dude is a little bit dissgusting. Hi, I discovered your pics on beard.org some time ago. And I read the short interview with you on the site. Am 26, I feel exactly like you. Had a full but trimmed bear till then because I did not dare more. After seeing your pics and interview I decided to go the same way and to let it grow. Plan to get the same beard as you on those pics. Thanks for your stand. Wow, there is really much useful info here!